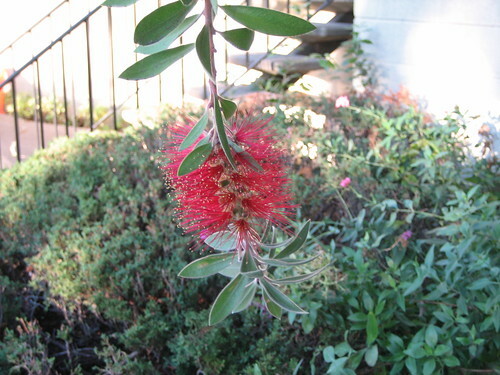 Bottlebrush is one of the rare species of plant where a single apical meristem can produce flowers and then switch back to producing normal vegetative leaves. Also the genus is native to Australia so obviously its presence in California is a result of human intervention. The red fibers that make up the majority of the flower are actually anthers (the male portion of the flower). The petals are almost vestigial, with the anthers taking over the petals’ normal function, attracting pollinators… though I don’t know what the pollinator of the bottlebrush is.